Like Jonah we need learn to trust his awesome power, experience his sovereign grace, fear his coming judgment and share his gut-wrenching compassion. All this is perfectly revealed in Jesus, the divine Evangelist, and as we look to him and as the Holy Spirit fills our hearts with his evangelistic compassion, our hearts will sing with the melodic line of Jonah, “Salvation comes from the LORD” (Jonah 2 v 11) and our lives will erupt with the evangelistic enterprise that our cities so desperately need. "This is the most readable and accessible commentary on the book of Jonah. The story of the prophet is filled with surprising twists and turns—and loads of lessons for us today. Richard is a trustworthy and insightful guide to the readers of this book. It will be a boon to preachers and listeners alike." "Some expositions of Jonah almost entirely miss God's evangelistic compassion—infinitely stronger than that of the prophet Jonah. Not so this popular exposition, written with verve and panache by Richard Coekin. 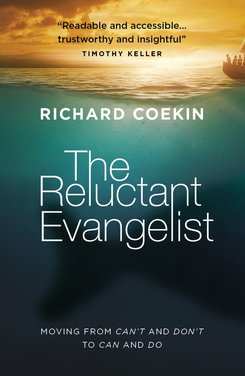 Coekin thinks through what it means to lose our reluctance to be evangelists. Above all, he reminds us of what Jonah rediscovered: 'Salvation comes from the Lord!'" "I have thoroughly enjoyed the deft exegetical touch displayed in "The Reluctant Evangelist". It’s accurate and light, faithful and pertinent. I thoroughly recommend it!"